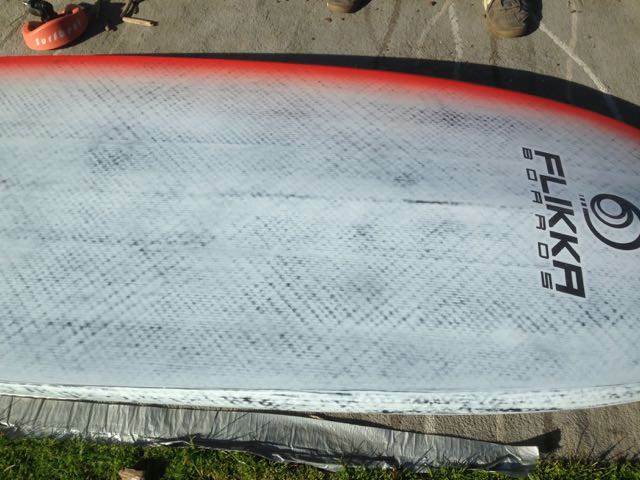 Here it is my first foil board: 117 Liters, 209x77 with 72 cm one foot off. Very light, it feels almost like carrying a normal windsurfer. After three times out with a gigantic converted JP Slalom this will feel like a picnic (maybe). Nice board! How do you like your Taaroa foil? I don't now yet! 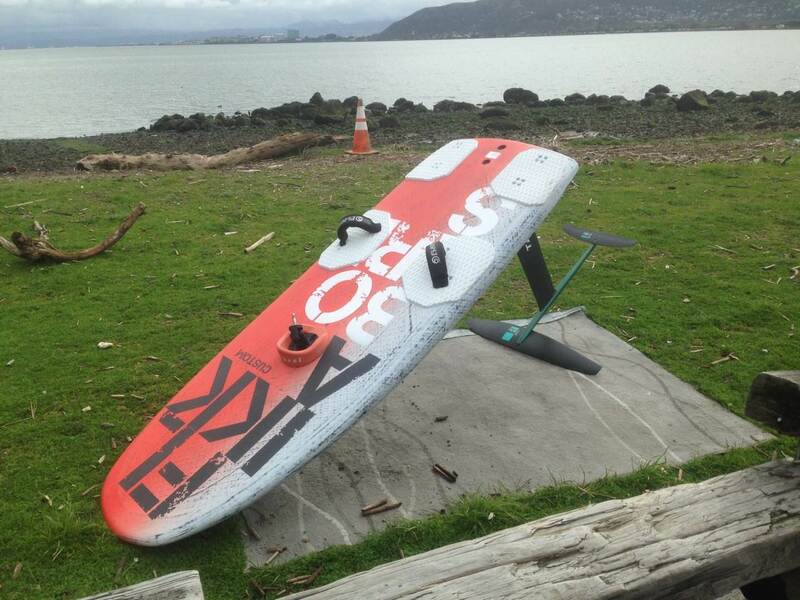 Yesterday was 9C and 15-20 knots west ... did not have the guts to try and went out with my slalom + 5.8. Tomorrow has 10-12 south in the forecast, maybe it will work. Coming from a NP aluminum + converted JP (240 long, a beast) should be much easier. The NP+JP was occasionally terrifying. It kinda looks like a jp 135. Minus the graphics. It looks a lot like a Horue Airtime. Just measured: she comes at 7.15 Kg with no straps. Straps are 315 grams/pair with bolts. That is light and it feels so even with the foil in, although that is probably thanks to the short length and lack of inertia. They use double row stainless steel strap inserts, carbon fiber mast track, and of course carbon fiber deep tuttle box. Big reputation building strong boards. The board is indeed similar to the Horue Airtime. 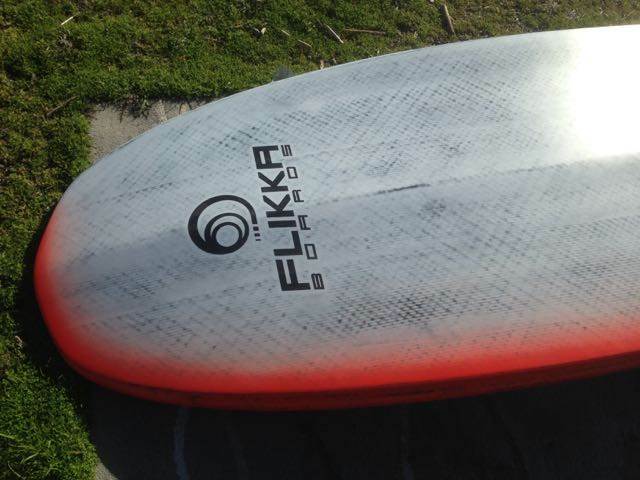 Flikka builds those for Horue and they share the digital Shape3D files necessary to shape the board. I am sure they discuss the shape together. You can do that to when you order. Lucas can send the Shape3D file before finalizing the order. It was fun to look at the details and everything can be customized, tarting from mast track to strap insert, overall dimensions, volume, all the way to ruin the design with your own suggestions. The expect ratio of this Flikka is a bit squarer than the Airtime. It is 207 by 77 cm maximum width by 73.5 at 30 cm from the tail. The Airtime 125L is 125 by 80 by 73.5. Otherwise it is similar some of the standards in foil hull construction, pronounced V in front with double concaves and very round "wrap around" rails starting around the front foot strap. I am 160 pounds and that, other than the reputation, is the main reason I went with Flikka, I wanted something a bit smaller than the Airtime. The other is the quick turn around, just a month, and the cost that including shipment to San Francisco was just $2000 and change for full carbon construction. 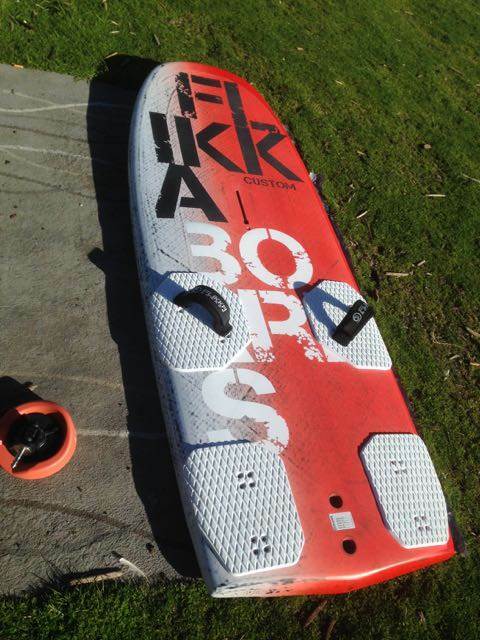 Im also looking for a Flikka Foilboard. There is a used one for sale in my country. It is 91cm wide. 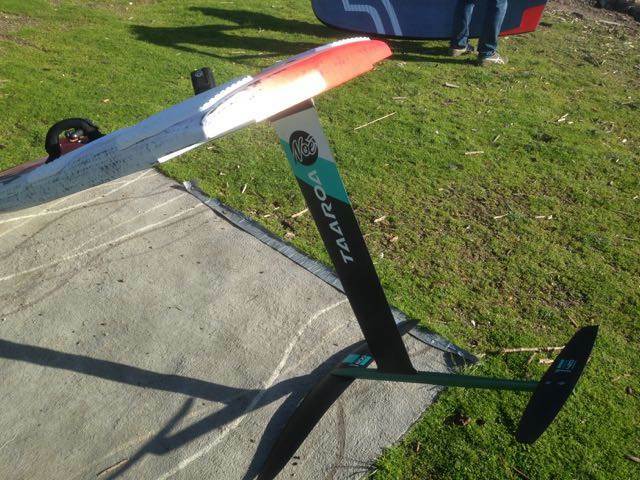 But do not know if it is good for my sb race foil with 115cm fuse. That sounds like a great deal. I paid similar for a semi-custom but the turn around was much longer. Beats the pants off of what we have to pay for bigger brand production board. It feels small. The length, 209 cm, really makes a difference. The volume, 117L, seems just about perfect. 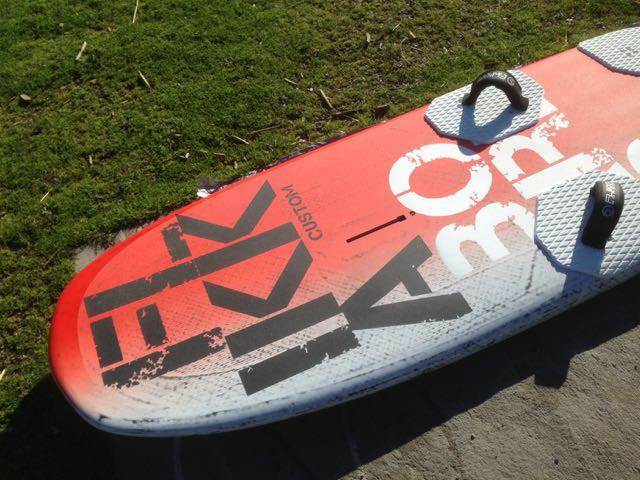 I am 158 pounds, and the board is out of the water when standing still. The board is very square shaped, 77 wide with a 73 back, and the tack is easy: the very wide front rescues all possible kind of mistakes. You can pretty much stand in front! In navigation it accellerates briskly, I am surprised by the lack of drag. I am out with a brand new Point-7 ACX 5.4, the wind is extremely weak (the sensor said 5 knots for the afternoon) and I am expecting to just slog around but ... here it is, a little gust and I am up. I don't even feel the transition. I am still too forward and it does not last long, but then I am going again ... so easy. The wind goes back to its 5-6 knots and I should be on the ACX 6.5, but it is enough for now. I'll post again when the wind really comes in Thursday/Friday/Saturday should be good. It looks a bit silly but I love the combination of the Surfbent mast deviator and the rigid Chinook mast base. I had to walk back to the lounching spot when the wind completely died and I just flipped the board upside down: zero damage or drag! Too early for real impressions but the Taaroa seems to do what it is supposed to do: easy! That looks like a sweet combo Duzzi! Nice writeup Duzzi, that board looks like it ticks all the boxes! It is, thank you, but I must say that foiling is proving to be harder than I thought. On one hand this thing is ridiculously efficient. I have been out in 10 to 14 knots and a 4.3 has been enough. I am 70 Kg. A 95kg buddy of mine in the same conditions is out with 6.3/6.8 + F4 and going strong. 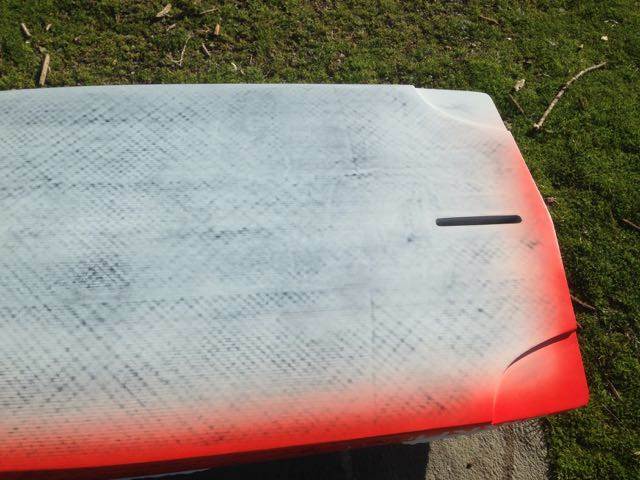 Not sure what I am going to do during the season ... with its regular 16-25 knots foiling is not going to happen. On the other hand I clearly do not know how to pump. I am not stable longitudinally, and I get quickly overpowered. It has been just three times but still this is not easy, and I am certainly not able to evaluate the performance of the Taaroa or Flikka! On the other hand I clearly do not know how to pump. I am not stable longitudinally, and I get quickly overpowered. I have been kind of caught in between my inefficiency, I can't fly the thing when others can, and my lack of skill if the sail is too big ... It has been just three times but still this is not easy. For sure I am certainly not able to evaluate the performance of the Taaroa or Flikka right now, a real review will have to wait a few months!